BBapply FAQ: How to cancel Flet's with OCN service. Q. I have an internet connection now and want to add a wireless router. How do I do that? A. It is impossible to tell you exactly how to configure a router because there are many such devices and they all have unique ways of being configured. So you should really look to the device's manual (or install wizard) for guidance. There are, however, some things which, if understood before you get started, will make the whole process easier. This page will try to explain what you need to know as simply as possible. Note: The following is about adding routers to your home or small business network. Large companies and schools, etc., especially those using fixed NAT IP addresses, have somewhat more complicated situations that are not covered here. 2nd Note: This guide is being written for residents of Japan using Felt's Hikari or Yahoo! BB ADSL services. If you are not using those services, then you can probably use this guide by ignoring references to those services. When connecting a router (wireless or otherwise) it's essential, before you start, to understand exactly how the device immediately upstream* from the new device you are connecting is configured because that affects how you will configure the new device. *By "upstream" I mean between the new router and the internet. "Downstream" is between the new router and you (your computers and other devices). Passwords you create yourself for restricting access to your LAN (your own local network in your home or business). This distinction is a source of unending confusion so when asked for a password you need to determine exactly who is asking: the ISP or your own network. In other words, it's important to understand that the configuration of your router's wireless settings is entirely separate and distinct from the actual network settings that control how your devices connect to the ISP. 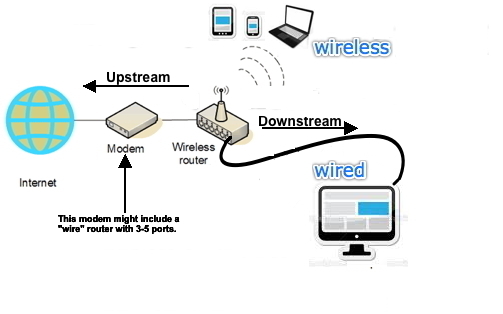 You will want to do the wireless configuration which is mainly setting of a network name and password to secure your local wireless access network, but first you have to get your router to connect successfully with your modem. This article is about how to add a wireless router to your provider's modem. Before adding and configuring your router, you must determine exactly what sort of system you have. If you are adding an additional wireless router to extend your current wireless system to a new area of your home, for example, then you will just put the new router in bridge mode. If it's the first wireless router, on the other hand, then you'll need to know if your modem includes a (wire) router or not as that will determine how you configure the router. If you have added a router to your modem before and want to add another wireless router for the purpose of, say, extending connectivity to the upstairs bedrooms, then bridge mode is the configuration you'll want because some other router upstream is already taking care of routing. You're just building a 'bridge' to the usptairs rooms. A device in bridge mode basically has no configuration of its own. It's just passing data up and down and letting an upstream device do the routing. So, in effect, it's not acting as a (smart) router. It's just a (dumb) hub making a "bridge" between the upstream router and the downstream devices. If you're adding a router to a system that has only a modem or a modem with a (non-wireless) router built in, it's a little more complicated. Maybe you can use bridge mode and maybe not. If not, you'll have to configure for DHCP or PPPoE and that choice will depend on what's happening upstream. First of all, if your network is functioning but you have only one device (your computer) connected, look at the device (modem) your ISP provided. Does it have a router built-in? You can tell by counting the number of LAN ports. Yahoo! BB ADSL usually has a (wire) router built in so attaching a wireless router is easy. < You can plug your new router into one of the LAN ports and put it in bridge mode (or DHCP) and there's a very high probability that your computers and other devices can connect automatically without any special configuration (except the wireless network name and password that you have to set). If the modem NTT provided has only one LAN port, then you will need to configure the router with PPPoE. That is, you will put the ID and password provided by your ISP (e.g., OCN, ASAHI Net or Yahoo! BB) into the router. NTT's Flet's services (both ADSL and Hikari) as well as most 'cable' internet services use PPPoE. Your ISP will be happy to help you configure your computer with PPPoE settings. However, they will NOT help you do the configuration of your router because it's not their device. IMPORTANT: When the provider's device (modem) has only one LAN port, the PPPoE configuration goes in the first device connected to the modem. The ISP will guide you if your computer is the first device but you're not doing that. Your router will be the first device so that's where the ID and password they provide you will go. If you're not sure what the ID and password is, you can call the ISP (e.g., OCN, ASAHI Net or Yahoo! BB) and they'll tell you how to find them in the Japanese letter they sent. They will then start telling you how to open your Network Settings control panel, etc., and enter the ID and password. Instead, however, you will put the ID and password into the router's PPPoE settings. You will also have to set your wireless router's "Wireless" network name and password. The name can be anything you want. The password you chose will later be put into your computer and other devices to connect wirelessly. If you use some other service, you can determine if it's using PPPoE or not by looking through the manual to see if you can find the term "PPPoE" with instructions about how to enter the ID and password. Your computers, tablets and smart phones can now all be configured to connect to the wireless network you created by choosing that network and entering the wireless password. IMPORTANT: If you have previously entered your Flet's ID and password into your computer's network settings before getting the router, you'll need to take them out and return your computer's settings to "Automatic" (or DHCP). I hope all of this made sense. If any part is confusing, let me know and I'll try to fix it. For fine print, important notices, disclaimers, etc. please click here. Web site ©1999-2015 Zazm, Inc.